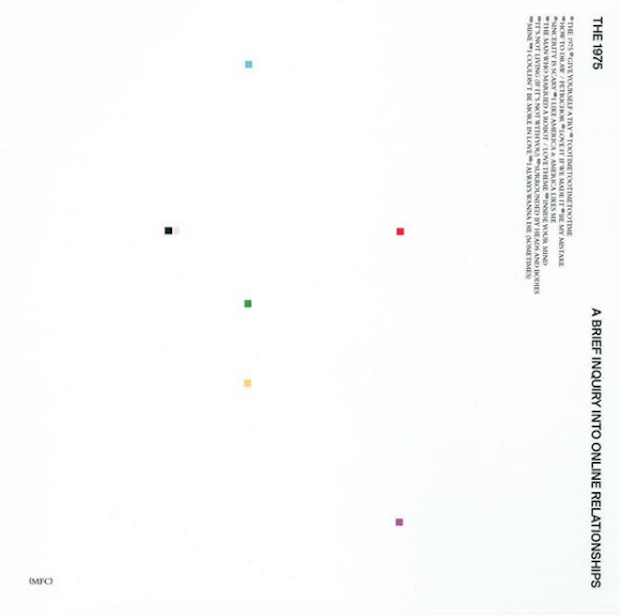 After The 1975′s shapeshifting and shockingly accomplished second album, I Like it When You Sleep, there has been a lot of excitement to hear what they could possibly do next. Anticipation was further fueled when the band themselves promised something on the level of The Queen is Dead and OK Computer. Matty Healy’s claims were very much in character for someone who has aimed high and not shied away from a challenge. A Brief Inquiry Into Online Relationships goes further into Healy’s psyche as the band covers even greater musical ground. Their ambitions to cover the broad range of their preceding album is clear from the pre-release singles. After a chopped and reconstructed take on their signature album intro, ‘The 1975′, first single, ‘Give Yourself a Try’ kicks things off. The incessant fuzzy guitar-line, borrowed from Joy Division’s ‘Disorder’, works well with the positive self-help message for eternally-distracted youth verses with Healy’s many inner conflicts. Musically, ‘Sincerity is Scary’ is the polar opposite with horns played by Roy Hargrove. Hargrove did the arrangements for one of the band’s biggest influences, D’angelo’s Voodoo. On this floaty soul ballad, a choir backs Healy as he sings about trying to cut through all the clutter and get down to the essence of being a better person. The Blue Nile shaped some of ILIWYS atmospheric moments, and on this release, the influence is even more obvious in stabbing synths and pounding rhythm on ‘Love it if We Made it’. It’s a welcome tribute to ‘The Downtown Lights’. It eventually gives way to a powerful disco-drenched groove in the second chorus. Matty’s voice is emotionally-charged as he lists harrowing examples of the worrying and very current political climate. He concludes, “modernity has failed us”. The passion in his voice as he pleads for change helps make it rival ‘Somebody Else’ as their finest song to date. Fans of the band’s past uptempo, glossy 80s pop (‘Chocolate’, ‘She’s American’, ‘The Sound’) might be disappointed. This is a ballad-heavy album with only two of the singles calling back to that sound. It’s no surprise that ‘TOOTIMETOOTIMETOOTIME’ has been the biggest commercial success so far. The buoyant melody and nursery rhyme chorus is extremely infectious. ‘It’s Not Living (if it’s not with You)’ is about Matty’s heroin addiction. It’s covered in a pristine mid-80’s pop sheen and has the album’s best chorus as he turns “collapse my veins in beautiful shoes” into a glorious singalong. ‘How to Draw/Petrichor’ condenses the experimental middle section of ILIWYS into a sophisticated six minutes. It starts with pretty twinkling keyboards and Healy’s auto-tuned voice before a glitchy beat takes over. When his voice reappears, it’s been processed even deeper as the song drifts in another unexpected direction. They continue to genre hop on the trap-inspired ballad, ‘I Like America & America Likes Me’ as Healy’s muddied voice repeats, “I’m scared of dying”. Since the band are aiming for an OK Computer crossover, they provide their very own ‘Fitter Happier’ interlude with ‘The Man Who Married a Robot’. The voice of Siri tells a story of a lonely internet troll and manages to be both absurd and moving (in a way, the essence of the band). As the story ends, it blossoms into ‘Love Theme’ — a gorgeous Disney-esque outro. The only real flaw on ILIWYS were the closing acoustic ballads that sounded out of place. The nakedly simple ‘Be My Mistake’ is similarly the least interesting song here. Much better are the ballads that close the album. Healy confesses, “I fight crime online sometimes, then write rhymes I hide behind” on ‘Mine’, a soft John Coltrane-inspired jazz ballad that recalls George Michael’s, ‘Kissing a Fool’. ‘I Couldn’t Be in Love More’ is a slick R&B slow jam with shimmering keyboards and key change that’s close to Bruno Mars’ should-have-been-a-hit ‘Versace on the Floor’. ILIWYS may have ended with a whimper, but they’ve not made that mistake again with the astonishing final track, ‘I Always Wanna Die (Sometimes)’. It begins with an acoustic guitar, and leads to an unashamedly bombastic, crashing chorus. It’s somewhere between a power ballad and a long-forgotten Britpop album closer (there’s more than a touch of Mansun to his falsetto). The lavish string arrangement offers a grandiose ending to the album. A Brief Inquiry is probably the most excessive major league album since Daft Punk’s Random Access Memories and every detail was just as obsessively crafted. For all the bluster and scope, this is a deeply earnest and personal album. Healy cares about the crumbling world around him and is consumed by questioning everything about it (even himself). It’s an engaging listen from a band who have quickly become as special as they think they are. A Brief Enquiry Into Online Relationships is out now on Dirty Hit. I am listening to this and thinking. Wooha there hold back on the autotune and vocal effects a bit, well a lot! Mostly I think the manipulated/processed vocals work pretty well. Especially the use of Siri on The Man Who Married A Robot. I Like America really reminds me of Kanye, especially his autotune heavy 808’s & Heartbreaks.